The soft chewy texture filled with red bean filling oozing with that first bite, that's when I fell in love with mochi. I vividly remember as an after school snack, mum would purchase these favourite treats of mine. 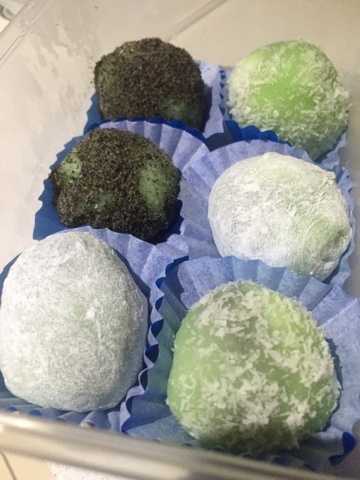 Wrapped in clear plastic, 6 mochi balls of pink, white and green filled with red bean which I would devour in a few minutes. To celebrate Chinese New Year 2016, I thought I would attempt to make rice cakes of some sort. This meant experimenting with different flours to attempt hoddeok, a sweet Korean pancake which reminded me of the street stalls in Korea selling these tasty treats filled with cinnamon peanut sugary goodness. With that down pat, my next experiment was to try mochi. Scouring the internet for an easy recipe, they varied from baking the glutinous mix to some fiddly and time consuming methods. 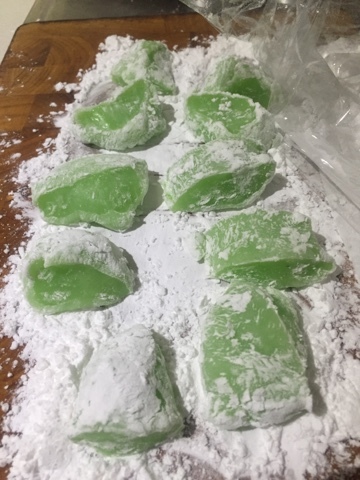 I adapted Maagchi's "Korean style mochi rice cakes" recipe for my purposes. 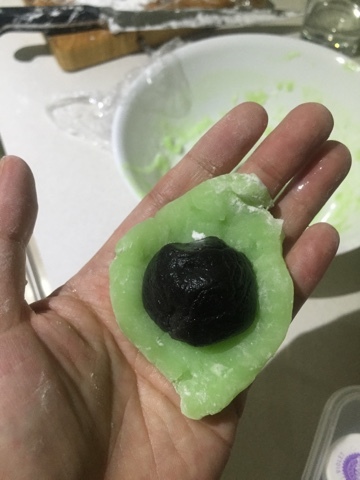 I found that you'll need to work quickly with the mochi to make the most of the elastic quality whilst its warm to cover the balls of red bean or black sesame paste. The kids will love stretching out the mochi and attempting to enclose their filling of choice. 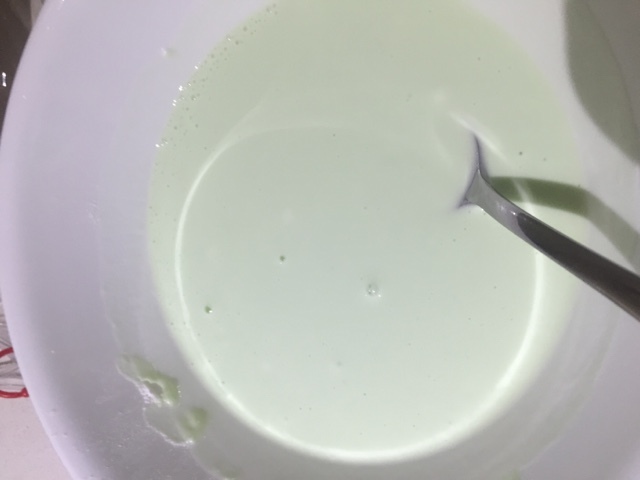 The Koreans call this dish chapssaltteok whereas the word mochi is a Japanese word that simply means “rice cake.” The Korean version of chapssaltteok uses the colour green which is created with green tea powder. 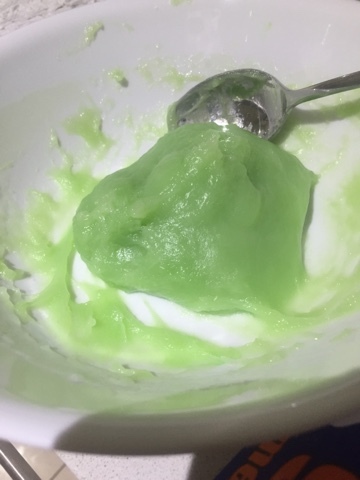 I found that mochi came in three different colours, white (plain), pink (with 2 drops of red food colouring), and green (with 1 teaspoon green tea powder or 2 drops of green food colouring). I would of liked to make the filling but due to time constraints, I opted to try the ready made pastes. Next task for me is attempt to make the white sesame filling that hubby loves so much. 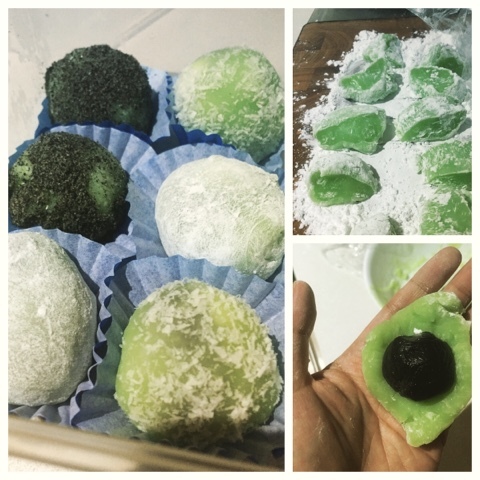 You'll never buy mochi again once you discover how easy it is to make it. I recommend you devour a few before the kids and hubby have discovered that you have made these delicious delights. 1. Roll your paste into 10 balls 2-2.5cm diameter for easy insertion into the rice cakes. I found putting the paste in the fridge to harden slightly made it easier to roll into balls. Or sprinkle a little starch powder to prevent the paste sticking to your hands when you roll into balls. Set aside to use later on. 2. 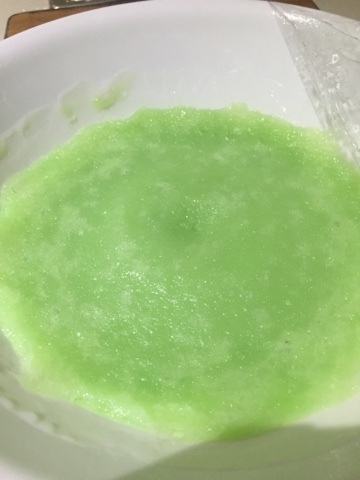 Place glutinous rice flour, salt, sugar and two drops of green food colouring into a microwave-safe bowl. 5. Remove the rice cake from the microwave. (Be careful taking off the plastic wrap or else be blasted with hot steam, this happened to me). Mix the rice cake with a spoon for 20 seconds. 6. Cover the rice cake with plastic wrap and put back in the microwave for HIGH 1min. 7. Knead the hot rice cake with a spoon as the best you can for about 1-2 minutes. This is the key part to get that soft chewy texture. 8. Sprinkle your choice of starch powder on your cutting board. Pull out the rice cake with a spoon into a sausage shape. 10. Cut the rectangle into half with a sharp wet knife and cut 5 even perpendicular cuts, to make 10 pieces of rice cake. Cover the rice cakes with plastic wrap to keep them from getting dried out. 11. Take one piece of rice cake, flatten and stretch out to a round circle about 5 cm in diameter. 13. I wanted to add an extra dimension of taste, so I dabbed water on the outside of my mochi and rolled this in coconut which the kids loved. 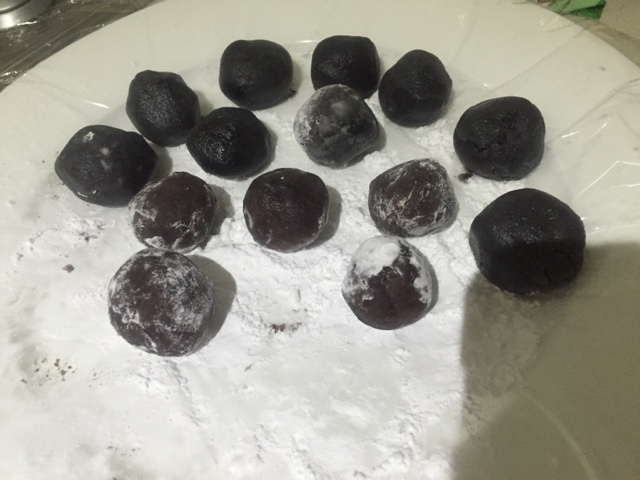 Hubby is more of a black sesame fan, so I rolled a few mochi in black sesame powder for him. 14. Repeat this until you’ve made 10 pieces of chapssaltteok/mochi ricecakes. 15. Eat a couple before the kids discover them. *Red bean and black sesame paste can be found at Asian grocery stores. *Potato starch and mung bean starch can be used. I prefer the mung bean taste so I went with mung bean starch. *It's extremely hot when it comes out of the microwave, so be careful with removing the plastic wrap.